Jim Lee and Scott Williams, Uncanny X-Men #268. While speaking with Captain America and Major Ivan Petrovitch in 1941, Logan states that any enemy of the Hand is a potential friend of his. 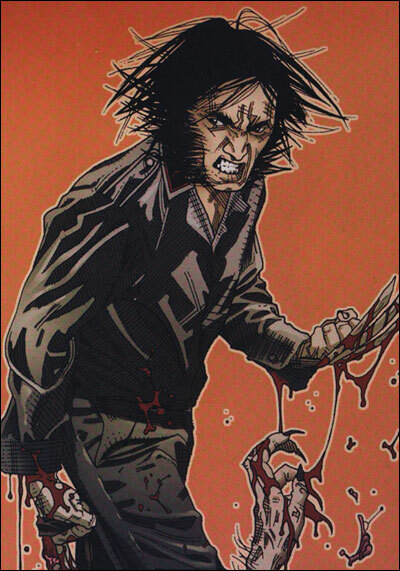 This would suggest that Logan had studied the Hand and had an interest in their demise, possibly as a result of Seraph’s dealings with the ninja organization. Logan recruits Gomurr the Ancient to help cure Betsy Braddock after she has been transformed and trained by the Hand, prompting Gomurr to remind Logan, “…you used to be a samurai way back when.” It is possible that their paths crossed when Logan was researching and fighting the Hand. During the Second World War, Logan reveals to a woman trained by the Coda that he is familiar with the Hand, Si-Fan (Fu Manchu’s organization), and the Coda. Logan further claims to have had “a history” with a Nazi-collaborator by the name of Kenyan, perhaps having met him during his tracking of the Hand. However, with the revelations of X-Men/WILDC.A.T.S. : The Dark Ages, it seems likely that the Coda and Kenyon were removed from Logan’s current continuity. In a near-death experience, Logan remembers seeking the camaraderie of the Devil’s Brigade in the Canadian Army. Steve Dillon, Wolverine: Origins #17. There are two major problems with the assertion that Logan fought against the Germans as early as 1939. First, Canadian troops did not see any action until the Dieppe Raid in August 1942, and for most Canadian troops, not until the summer of 1943. Second, there was a historical Devil’s Brigade that fought in World War II, a joint American-Canadian commando unit. The 1,800 strong First Special Service Force was founded on July 9, 1942 and trained in parachute, ski, mountain and amphibious mountain techniques near Helena, Montana. The Devil’s Brigade spearheaded the 1943 invasion of Kiska in the Aleutian Islands and led the breakout in Anzio during the first half of 1944. In order to accommodate the assertions made in this issue, we need to treat this ‘Devil’s Brigade’ as a different top secret force, running missions clandestinely before the rest of the Canadian military engaged in combat. Logan reveals to a Japanese woman that the men in the barracks called him, “badger, ferret, skunk. Said a real woman would never make time with someone who’s all hair and stink,” like him. Perhaps the camaraderie he desperately sought was not to be found in the Devil’s Brigade. Wolverine and Hercules reminisce about the days shortly before the occupation of France when Hercules, posing as the Sub-Mariner, battled a Nazi robot in the streets of Paris and unwittingly provided Logan with the diversion he needed to assassinate a Nazi bigwig. As the invasion of France did not commence until May 10, 1940, Logan needs to have run this top secret mission while with the Devil’s Brigade. In lowtown Madripoor during August 1941, a young Captain America and Major Ivan Petrovitch of the Soviet Union fight a host of ninjas from the Hand. As the ninjas begin to take control, Logan appears and quickly helps to rout the Hand. Later that evening, Logan shares a table at Seraph’s, an establishment with the feel of Rick’s Café Americain, with a civilian Captain America and Major Petrovitch. When Logan ‘mistakenly’ spills a drink on the Nazi Baron Von Strucker and nearly causes a fight, the diminutive owner, Seraph, scolds both the Nazis and Logan, preempting any confrontation. Major Petrovitch then tells Logan that the Nazis, working with the Hand, kidnapped a young Russian girl under his protection, Natasha Romanoff (the future Black Widow). Logan locates the car with the kidnapped Natasha, slams into its front window, and grabs Natasha, using his body to protect her from a hail of bullets. Believing Logan dead, Captain America and Major Petrovitch free Natasha from the car but are quickly captured by the Nazis. Natasha is taken to a ceremony where the leader of the Hand, Jonin, prepares to anoint Natasha as the Hand’s future Master Assassin. Logan, dripping blood but very much alive, arrives in dramatic fashion and frees Captain America and Major Petrovitch. In the following battle, Logan demonstrates remarkable skill with his samurai sword and routs countless ninjas, rescuing Natasha once again. Seraph, revealed as Logan’s close friend, drives Captain America, Petrovitch and Natasha to a local airfield, and they fly off to safety before the Nazis can stop their departure. A landmark issue when it came out, Uncanny X-Men #268 is the first time we definitively witnessed Logan during World War II, confirming rumors that he had met Captain America during that time. According to Jim Lee, the story originated when Chris Claremont asked him who his favorite characters were, “Black Widow, Captain America and Wolverine. ‘Madripoor Knights’ was really this improv thing where he [Claremont] came up with a cool ‘Casablanca’-inspired story, set in the past, featuring all these characters in a way that made sense.” It is also interesting to note that Baron Strucker fails to recognize Logan, even though he met a future version of Logan some five years previous. Wolverine mentions to Captain America, “Yer as… set in yer ways as ya were when I knew ya fifty years ago,” suggesting both Wolverine and Captain America remember their escapades together from this time period. Logan specifically remembers fighting against the Hand with Captain America. After Captain America’s death and with his memories intact, Logan reminisces about previously undisclosed revelations from his first meeting with Captain America. The plane used to save Captain America and crew was originally intended for Natalia to escape from Madripoor after her mission. When the plane departs, Seraph gives Logan his new orders, “Exploit the American’s confidence to get close to him — find out if he can be ‘turned.’ Failing that, find out if the experiment that produced him can be replicated.” Failing that, Logan is to kill Captain America. It is further revealed that Logan had been ordered back to Madripoor to work with Seraph, ostensibly in preparation for Captain America’s arrival. Gravely wounded, Wolverine hallucinates Sergeant Nick Fury in full World War II regalia, sporting an eye patch. Since Nick Fury never wore an eye patch during the Second World War, we can assume that Logan’s hallucination combines the Nick Fury he met during the war with the spy from the 1950s. 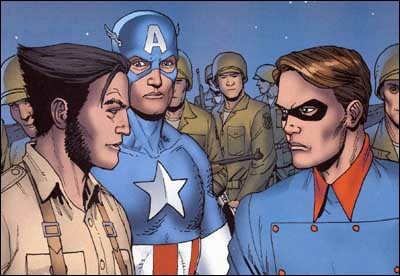 Logan claims that the United States had clandestinely been involved in World War II since November 1941, “partnering with the U.K. and the Free French in what ended up being called Operation: Blueboy.” The United States’ first major airborne assault included Captain America and Bucky, but failed due to a series of logistical errors. Captain America’s plane went missing and Logan, under orders from Cyber, was told to find them. With the American Nick Fury as his guide, Logan locates the general area where the plane went down and notes, “All it took was a few abductions, some pliers an’ one or two car batteries.” With the further assistance of Nick Fury and the S.A.S., Logan finds the plane under siege by the German Afrika Korp. 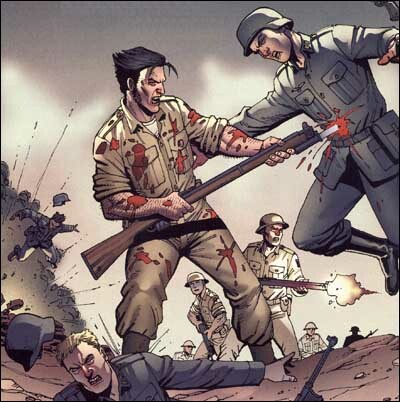 Logan leaps into the battle and guns down the Germans single-handedly, freeing the Americans and earning the admiration of Captain America (and the enmity of his sidekick Bucky Barnes). The Operation: Blueboy as described in this issue is fictional. But there seems to have been an actual Operation: Blueboy that took place during the Korean War involving intelligence work behind enemy lines. Protective of Captain America, Bucky attacks Logan, who does nothing to defend himself, further serving Logan’s goal of gaining the trust of Captain America. At that, Captain America, Bucky, Logan, Nick Fury and the rest of the assembled troops begin their long march to Djerba, a Nazi-occupied town off the coast of Tunisia, to engage Nazi General Rommel’s rear flank and accept the surrender of German turncoat Major Hans Guettzer. At Djerba, Captain America shows his potential by wiping out the rear flank nearly single-handedly. But it seems that Bucky disappeared to complete an additional secret mission, capturing Baron Von Strucker and stopping his fledgling paramilitary operation, Hydra. With Guettzer’s surrender in hand, Captain America chases after Bucky, not realizing that Logan is in pursuit of them both. Logan arrives at the secret Hydra base and kills a host of guards quite brutally, gaining the attention of Captain America who is still searching for Bucky. The duo discover Baron Von Strucker in a sub-basement complex rallying his Hydra minions and presiding over the execution of Bucky. Bucky, however, planned the whole thing and takes the opportunity to kill Baron Von Strucker on the spot. Captain America and Logan leap to Bucky’s defense against the now rioting Hydra followers, who are all subsequently gunned down by Nick Fury and his men who had followed along as well. Unfortunately for Bucky, Nick Fury reveals that the brown-eyed Von Strucker dead on the ground is a body double for the blue-eyed Baron. Captain America announces that they will all search for Baron Von Strucker, and Logan and Bucky, still highly suspicious of each other, agree to team up. Logan pumps Bucky for information on Captain America and knocks him unconscious when Bucky pulls a gun on him. Just then, Logan realizes that Von Strucker is in a nearby room — on the phone with Seraph. Logan is given his new orders: protect Baron Von Strucker at all costs and kill Captain America. After some devious planning, Logan shows up with Baron Von Strucker as a prisoner with a highly suspicious Bucky in tow. Everyone boards a transport plane, but before Bucky can share his suspicions with Captain America, the plane comes under attack from German Messerschmitts. Bucky is wounded during the attack and the plane is forced down, conveniently at the feet of Baron Zemo, where Logan is revealed as a double agent. Captain America, enraged at this traitorous act, attacks Logan and beats him to a pulp. But Logan, it seems, didn’t tell the Germans about Bucky, who shoots Logan in the chest and forces the Nazis to retreat in a hail of bullets. Believing Logan dead, Captain America, Bucky and the rest of the Allied soldiers depart. And when Logan eventually does comes to, he has no memory of these events. Many of the sequences with Baron Von Strucker, Seraph and even Baron Zemo are quite absurd, no matter how you slice it. And the traitorous turn of events for Logan and Seraph left an odious taste in the mouths of many older readers as it served to destroy Logan’s perceived WWII heroism. In hindsight, Logan’s actions here are quite mild compared to what he would do before the war was over. When Professor Xavier assists Wolverine in recovering his memories, Wolverine glimpses a memory of fighting alongside Captain America and Bucky. Logan remembers fighting side-by-side with Captain America in the Italian Alps in 1942 in an attempt “to close the border.” Logan, with his now familiar samurai sword, is in charge of the mission, ordering Captain America to take out a tank. When Logan goes after the German commanding officer, he is shocked by the C.O.’s feral features and his ominous words, “You won’t even remember today until he wants you to.” A hand grenade shatters the battle and Logan finds himself at the feet of a mysterious figure (presumably Romulus) who utters the equally mysterious words, “Quod sum eris” — I am what you will be. Logan, his claws in full view, is shown in a single panel fighting alongside Captain America who is oddly using his original triangular shield. As this is a book of origins, we can only surmise that this panel is merely presented in hyperbolic fashion and does not reveal a previously unknown adventure between Logan and Captain America. On orders from Canadian Intelligence, Logan sneaks into a cocktail party on the outskirts of Nazi-occupied Paris and steals an ancient scroll, thought by Hitler’s occultists to be the most powerful artifact in the Fuhrer’s arcane arsenal. 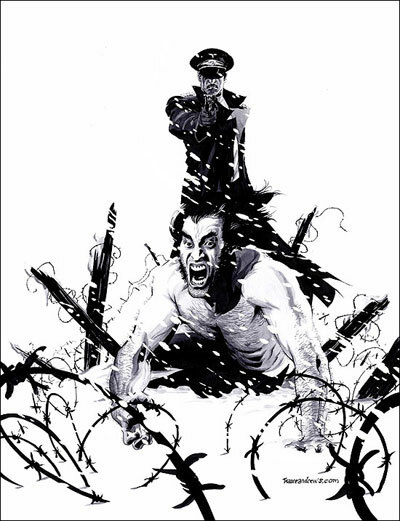 While attempting to escape, Logan is discovered by an old acquaintance, a now high-ranking Nazi by the name of Eikert, who takes the scroll and orders Logan killed. Logan dispatches most of the Germans, but Eikert escapes. Under pressure from superior artillery, Logan flees the castle and tangles with a martial arts-trained woman by the name of Zannah. When Logan and Zannah simultaneously realize that they are both after Eikert and the scroll, they join forces and chase after his fleeing automobile. Logan leaps aboard the automobile and finds Eikert transformed into an extra-terrestrial insectoid creature, a Daemonite. Zannah kills the Daemonite with her sword, and Logan retrieves the scroll, moments before the creature and the automobile careen off of a cliff. Zannah knocks Logan out from behind for his troubles and leaves with the scroll. 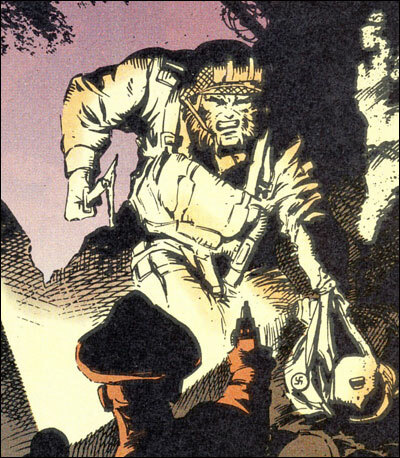 Later, Logan receives orders from an American Sergeant (possibly Nick Fury) in Paris to pose as a German SS officer in order to track down the scroll. At a train station, Logan sights Zannah who is having problems with her paperwork and the ever officious German officials. Logan clears things up with a bluff and escorts Zannah onto a train headed towards Vienna. Logan, displaying considerable knowledge of the Hand and Si-Fan, realizes that Zannah is part of the martial arts group, Coda. It is on this train trip that Logan learns that the scroll is, in fact, the Lazarus Scroll. According to Zannah, the scroll is extra-terrestrial in origin and is to be used to resurrect a powerful Daemonite Lord, Ebron. Soon Logan, now armed with a leather glove sporting three claw-like knives, and Zannah run into another Daemonite creature and a mysterious figure, Kenyan, who Logan seems to be familiar with. After a long scuffle, Logan kills the Daemonite, but Kenyan escapes with the scroll, courtesy of a Luftwaffe Stuka. Kenyan apparently planned ahead as the train is destroyed when explosives demolish an oncoming bridge. Logan and Zannah barely escape and head for the underground Nazi vault where the resurrection is scheduled to take place. Logan and Zannah intercede and kill Ebron before she can reach full power, destroying the vault in the process. Logan escapes with minor injuries; Zannah is not heard from again. 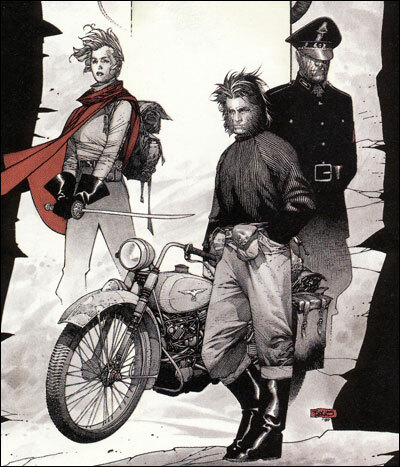 Travis Charest, WILDC.A.T.S./X-Men: Golden Age #1. In France, 1942, Logan joins the French Resistance, helping it to become a greater thorn in Germany’s side than ever before. To celebrate their success, Logan drinks with fellow resistance members as they question him about his high tolerance for alcohol and his remarkable knack for surviving gunshot wounds to the chest. They are interrupted by Roberto Estacado, the infamous assassin known as the Spaniard, who enters the bar and calmly informs Logan that he is his next target. Logan slips away, but later that night, the Spaniard tracks him down and fires upon him from a second-floor window using a demonic ‘Darkness’ bullet. Logan expertly blocks the shot with the body of a passing Nazi soldier, but the wound explodes as a dog-sized demon shockingly emerges from the bullet hole. Logan catches the second shot with his bare hands, but, again, the projectile transforms into a demon that engulfs his hand in its jaws. Instinctively, Logan pops his bone claws and guts the demon in two. In an instant, Logan is inside the darkened building and captures the Spaniard, cutting off an arm and a leg in the process, before finally killing the assassin with his claws. While working on an intelligence mission in Berlin, Logan falls in love with a young woman, Catharina. Together, they plan an operation concerning a German scientist, Dr. Lukas Maier. Logan is captured during the mission and finds out that Catherina set him up to save the lives of her imprisoned sisters. Catherina is shot in the head for her troubles, and Logan is gassed into unconsciousness, vowing revenge on Dr. Maier. While the captions in this story state it takes place in 1943, I will take the liberty of shifting this story into 1942 where it more easily fits into continuity. During the winter of 1942 at the Nazi death camp located in Sobibor, Poland, the most recent commandant in charge has just committed suicide. His replacement, Major Bauman, surveys the camp and finds one prisoner, Logan, staring at him menacingly. He orders him shot and dumped in the furnace. That night Bauman is shocked to see Logan alive and well, whistling at him through the darkness. Bauman again orders him shot and burned. Over the course of the following weeks, this scene replays itself over and over again, each time with Logan seemingly being killed in increasingly grislier fashion, only to appear in the camp the next day, none the worse for wear. On May 28, 1942, Major Bauman confronts Logan, who is bound to a chair, in his office and savagely beats him with a wine bottle. As Bauman loses more and more control, Logan frees himself just as a broken lamp ignites the entire building. Major Bauman perishes in the fire, and shortly, a new commandant is appointed, who sees Logan staring at him as the he is driven in. In a touching afterward, Mark Millar acknowledges that the legendary Will Eisner suggested, shortly before his death, that Millar remove all of Logan’s dialogue to give the story the eerie feeling of an EC ghost story. It is interesting to note that even after reading the script to this story, Eisner related that he still couldn’t pick out Wolverine out of a line-up. In discussing his opposition to superhero registration, Wolverine tells Luke Cage, “Few years back, few decades actually, I had some friends in Germany. ‘Had.’ Registration didn’t work out too well for them.” This is perhaps a reference to the prisoners Logan knew from the Sobibor death camp. Logan mentions that a woman in a painting has the same eye color as a girl he met at Arnhem Land in 1943. This would seemingly place Logan at Arnhen Land in the Northern territories of Australia during a Japanese air raid that took place at the Millinggimbi airfield on May 9 and 10, 1943, a site used by the RAAF as a staging and refueling stop. Logan reveals he was at the Tule Lake War Relocation Center in Newell, California in 1943, and personally selected individuals of Japanese descent living in the United States for a top secret experiment. 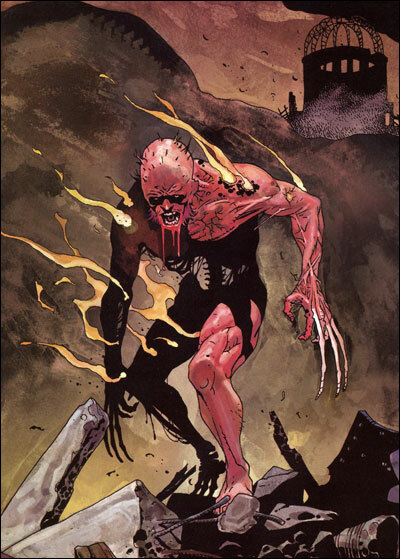 The eleven individuals, their families quietly slaughtered, were subjected to inhuman experimentation for 118 days, at which point those running the project terminated it, ordering Logan to kill everyone involved, from the experimenters to the victims, and to personally blow up the underground lab himself. This storyline is the most troubling of all Logan’s experiences to date as it firmly shows that Logan crossed over the line to war criminal. Logan is unquestionably involved in whole-scale slaughter of civilians and human experimentation, possibly involving U.S. citizens as two-thirds of those interned at the actual Tule Lake camp were American citizens. 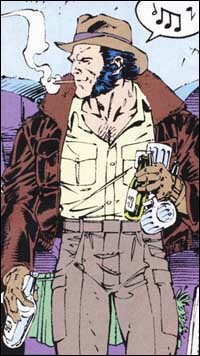 While some have suggested that Logan was under the influence of Romulus, Logan states that he is the only person still alive with knowledge of this project (“Now I’m the only one who does [know].”). And the fact that he takes his son to the caves to hide him from Romulus demonstrates that Romulus was unaware of this project and was not involved in brainwashing Logan to be a part of it. It is why I was quite vocal in my concern over this tale when it was first published because it is difficult to reconcile Wolverine as a hero when his past equates him willfully acting as the moral equivalent of a Nazi deathcamp architect. During a conversation with Nightcrawler, Logan notes that he was a wartime soldier for Canada and has the medals and commendations to prove it. As most of his wartime efforts up to this point had been top secret, it seems likely that the medals he references were awarded for his efforts during the D-Day invasion. Adam Kubert, Mike Sellers and Steve Buccellato, Wolverine #78. Sgt. Doolin of the Royal Canadian Mounted Police reminisces about June 6, 1944. It was a moonless night over Ranville, Normandy when he and Corporal Logan were members of the 1st Canadian Parachute Battalion, jumping as an element of the 6th British Airborne Division during the D-Day invasion. Both got hung up on trees during the jump, but Logan freed himself with his Fairburn knife. When a patrol from the 21st Panzer-Grenadiers discovered the two of them, Logan killed the entire German patrol with only his big double-edged Fairburn knife (most probably a Fairbairn-Sykes dagger used by British commandos during World War II). A vampire by the name of Bloodscream remembers meeting the knife-wielding Logan on the black night of June 6, 1944 during the invasion of Normandy. Val Semeiks and Chad Hunt with Al Milgrom, Wolverine #106. Stavros, a Greek gardener, remembers the British sending a Canadian corporal to teach the Greek Nationalists to kill Nazis with explosives and a Fairburn dagger. This Canadian then joined the Greeks on a mission to wipe out a nearby SS compound. It is later revealed that the Canadian was Corporal Logan. The British did send units to Greece throughout 1944 to harass the Germans, helping the Greeks to force the German’s departure from the mainland in September 1944 and the last remaining islands by May 1945. Stavros still possesses Logan’s dagger to present day, suggesting that Logan gave his knife to Stavros in the final months of the war. Logan joins a demoralized squad of American soldiers in the snowy Ardennes Forest during the winter of 1944. When German tanks begin to run over their positions the following day, Logan singlehandedly attacks one of the tanks and kills the German officer leading the charge with his claws. The Allied forces, emboldened by Logan’s heroism, attack from the flank and rout the rest of the German forces. After the battle, Logan is accepted by the soldiers, embodied by the invitation for a “cup ‘a Joe” to celebrate their victory. Wolverine remarks that a shelled out area reminds him of “…Dresden after the English Air Force lit it up.” This would be referencing the Allied bombing from February 13-15, 1945. It is possible that Logan saw the carnage first hand. On April 28, 1945 over German airspace, Logan and a group of American commandos are shot out of the sky by a squadron of German Focke Wulfs. His parachute in flames, Logan uses his claws to catch hold of one of the attacking fighter planes, kills the pilot and takes control of the German craft. The only Allied survivor, Logan ditches his stolen transport and kills a passing German motorcyclist, driving off with the bike and making for a heavily fortified installation that his mission claims is housing Germany’s super soldier program. As Logan infiltrates the facility, American planes bomb from above and Logan unwittingly flees into the path of an oncoming German tank, forcing Logan to spend a day recuperating from effects of the bombing and the tank. By the evening of April 30th, Walpurgis night, Logan slips back into what remains of the installation and finds a scared German woman standing guard. Logan tells her to go home to her family, but she surprises him and plunges a knife into his chest. With a hint of regret, Logan kills her with his claws and slips into the basement of the facility, witnessing a Nazi scientist transform a decorated German soldier into a werewolf. Logan and the werewolf fight, but the werewolf’s claws prove to be more effective. Logan finally rips a medal from around the werewolf’s neck and fatally stabs him with the commendation made of silver. Before Logan can kill off the scientist, Nick Fury arrives and tells the corporal to stand down, as the U.S. has need of scientists for the coming battle with the Soviets what with Captain America and Bucky dead at the hands of Baron Zemo. Logan remembers waking up in a Japanese prisoner of war camp and meeting an American prisoner, Lieutenant Ethan Warren, after a mission to blow up a train in Burma goes awry. When the guards open the cell door, Logan dispatches them and the two escape into the countryside. Making their way to freedom, Logan is enchanted by a beautiful Japanese woman, but Warren demands she be killed to ensure their safety. Logan disagrees and threatens Warren with his life, finally chasing him away. The woman, Atsuko, invites Logan back to her house and as the two embrace, she reveals the name of her town — Hiroshima. After Logan and Atsuko spend a blissful night together, Lieutenant Warren sneaks into the house and shoots Logan in the head. Warren then advances on Atsuko who surprisingly holds her own in a nasty fight, that is until Warren impales her with his bayonet. Just then, Logan gets up, very much not dead, and proceeds to beat Warren to a pulp, as Warren tries to explain that the two of them are exactly the same. When Logan gets in a killing shot with the honored sword of Atsuko’s father, Warren surprisingly does not die, but explains that he, like Logan, is unstoppable. But before they can finish their fight, Warren sees a B-17 bomber overhead. A bomber by the name of Enola Gay. With a bomb by the name of Little Boy, for it is August 6, 1945. As the mushroom cloud recedes, we find that Logan, with bone claws extended, is still very much alive. Logan remembers falling in love with Atsuko and asking her to come with him. “Madripoor Knights,” Wizard Wolverine Masterpiece Edition, Dec. 2004. I have just reread this section and it became clearer what what going on for Logan during WWII, both in the older storylines and in Way’s interpretation in his “Origins” series. Thanks for these helpful chonological essays. Sorry but you’re dead wrong about the Canadian Army only seeing action in and after Dieppe… the Canadian Expeditionary Force was there from the very outset of the war.